2015 KTM 1050 Adventure. Picture credits - KTM. Submit more pictures. The KTM 1050 Adventure is made for the same adventure as its bigger brothers; the KTM 1190 Adventure, KTM Adventure R 1190 and KTM 1290 Super Adventure. A little smaller, lighter and with lower fuel consumption, the 1050 Adventure stands proudly alongside its larger siblings. 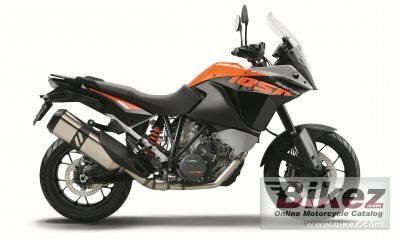 It is a supremely competent and well equipped motorcycle at an attractive price. Rear brakes: Single disc. ABS: Two-piston calipers. Ask questions Join the 15 KTM 1050 Adventure discussion group or the general KTM discussion group. Bikez.com has a discussion group for every motorcycle. Here you may find answers to common questions about the model. If you do not find what you are looking for, you can ask questions. Try out the 2015 KTM 1050 Adventure discussion forum. You can sign up for e-mail notifications when other users answer you. If you have information about any technical issue related to this motorcycle, please leave a comment for other riders.